> WATCH 2002 championship game highlights and interviews in a report from WCPO's John Popovich in the player above. COLUMBUS, Ohio – When the Roger Bacon boys basketball team played in the 2018 state semifinals, they might have heard the echo of the cheers from the Spartans' unforgettable state championship 16 years before. 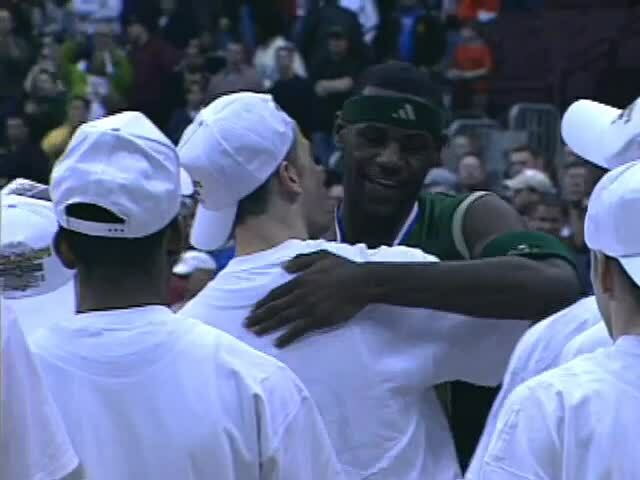 Bacon's 71-63 victory over LeBron James and his nearly unbeatable Akron St. Vincent-St. Mary's team in 2002 is still one of the most talked-about games in Cincinnati preps sports history. 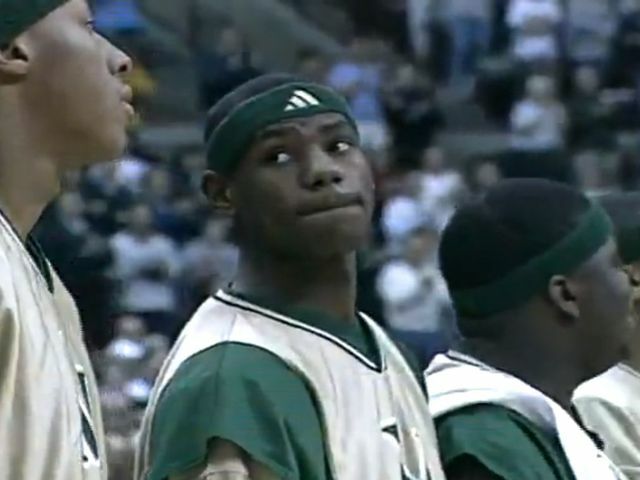 A young LeBron James before the tipoff in the 2002 Ohio Division II championship game. James, a junior who wore Michael Jordan's No. 23, had been already been acclaimed as the next Jordan. The week before, he was featured on the cover of Sports Illustrated. The headline proclaimed the 6-7 phenom "The Chosen One." LeBron guaranteed victory in a TV interview the night before the state title game. But when Roger Bacon's Beckham Wyrick greeted him with a forearm shiver the first time down the court, it was GAME ON. A state-tournament record crowd of 18,375 packed Ohio State's Value City Arena. Scalpers charged $200 – a king's ransom then - to see "The King." Most expected SVSM to cruise to its third straight Division II title with James. The Irish were 75-0 against Ohio teams in James' first three years, losing only three games against the best national competition. But Roger Bacon came in confident. A year before, coach Bill Brewer knew he would have a strong team, so he scheduled a December game against James and the Irish at the MAC Center at Kent State. The game was tied at 66 with four minutes to go, and although SVSM won, 79-70, the Spartans vowed the next time would be different. "I'm glad Coach scheduled that first game," 6-8 center Monty St. Clair said after the title game. "Going into that game, we had no idea what to expect, no idea what he (James) would do against us. In this game, we knew exactly what to expect." Roger Bacon, 24-3 coming into the title game, was no team to overlook. The Spartans were tall, aggressive on both offense and defense, and determined. They had four double-figure scorers, led by 6-3 all-state guard Josh Hausfeld. Roger Bacon and SVSM both made a statement in the state semifinals, when SVSM won by 40 and Bacon won by 52 – a tournament record. "They had the best player, but we had the better team," Brewer said. The championship game started at 11 a.m. and James woke up with back spasms. Then he woke up again when the 6-5 Wyrick gave him a forearm after the opening tip. "I wanted him to know we weren't going to roll over like a lot of teams who played against him," Wyrick said. Brewer's plan to stop James was to not try to stop him. He hoped Wyrick could contain James man-to-man (with St. Clair and Frank Phillips taking turns) and assigned the others to shut down James' teammates. And his plan worked for the first three quarters. James had only eight points at halftime. Roger Bacon led by 11 late in third quarter. But James brought the Irish back. He made a steal at half-court and a thunderous dunk that brought the crowd to its feet. Then he hit a half-court shot at the buzzer to cut Bacon's lead to five. By then, James had four fouls, but he took over on offense. He moved to the low post and scored 13 points in the last eight minutes. He dunked to make it 66-63 with 30 seconds left. James then had chance to tie the game, but he passed off, and a teammate missed a 3. Another Irish player's technical foul helped Bacon hold on. James, who finished with 32 points, was gracious in defeat. He went over to the Roger Bacon bench and hugged and congratulated the Spartans. "I respect them a lot," James said afterward. "If you can beat us, I have even more respect for you. I'm upset with myself because I guaranteed a victory and we didn't come though." The stats told the story. The hustling Spartans grabbed 13 offensive rebounds and won the battle of the boards, 32-18. The 6-4 Phillips shut down SVSM guard Dru Joyce III. Joyce scored 21 against Bacon in December. He got six in March. Roger Bacon had four scorers in double figures (Hausfeld 23, St. Clair 15, Wyrick 14 and Phillips 13). SVSM had two. When it came time to pick the all-tourney team, it was those four Roger Bacon players and LeBron. Hausfeld was MVP. James came back for his senior year and led SVSM to a third state title. Then he went straight to the NBA, signed a $90 million deal with Nike, won two NBA titles and four MVPs, broke Cleveland's heart and put it back together again, and you know the rest. The Spartans – the only Ohio team to ever beat LeBron – knew right away they had done something special - something they would cherish forever. "This is the best feeling in the world," Hausfeld said. "This is when all eyes are on you and you have to step up to the challenge. We beat the best." Their story led to a book appropriately titled, "The Chosen Ones: The Team That Beat LeBron." Ten years later, the Spartans gathered for a reunion at Roger Bacon. Wyrick, who was playing professional ball in Europe, flew in from Germany. They toasted Brewer, who was only 42 when he died of a heart attack in 2007. He was a tough coach and some players didn't like him at the time, but they saw through that later. "He was the best coach I ever had," Hausfeld said in a fine story by Tom Reed on Cleveland.com. "He was really hard on me only because he saw the potential. I still wish I could go back to him for advice."